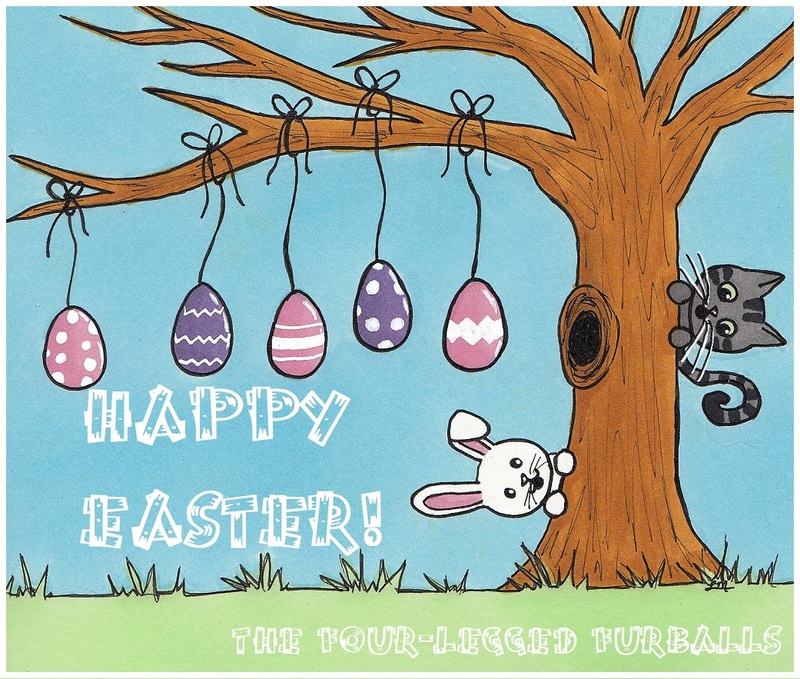 to all of our friends! We hope you all have a fun, festive, and safe day. If your human has no style, be sure to help them decorate for the occasion. 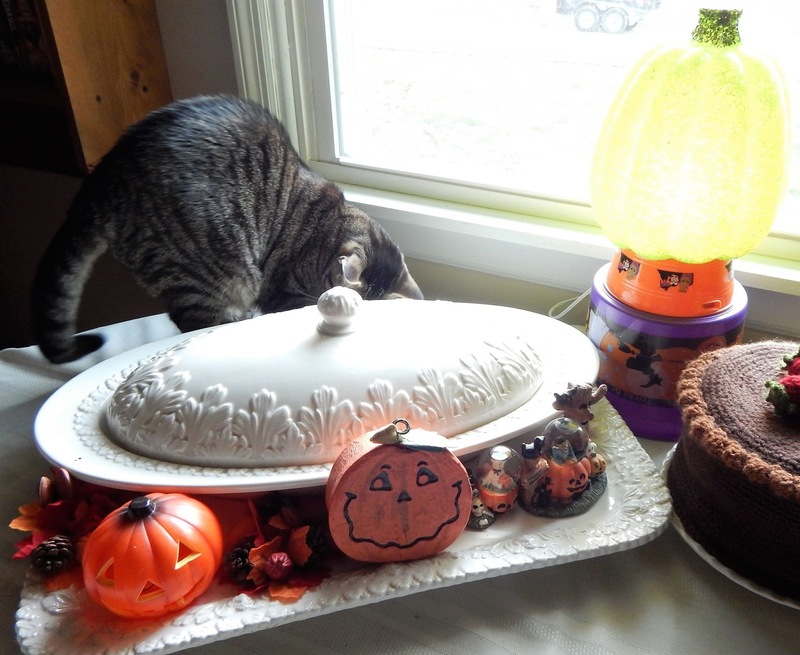 Now, bring on the spooktacular treats! 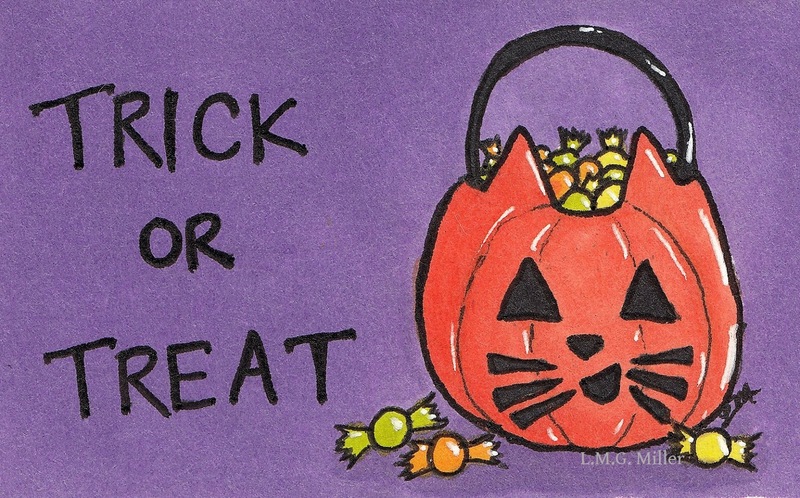 Wishing you all lots of treats and no tricks this Halloween! Our last Halloween tip is to ensure that your furbaby is wearing some form of identification. We often mention in summer months, when outdoor adventures are more common, the importance of ensuring that your pup or kitty has identification and contact info on them. But, the same can be said for all year round, including times of the year when the front door might be a busy place. One of these times is Halloween, especially if you are one to hand out candy or invite friends over as part of your Halloween festivities. 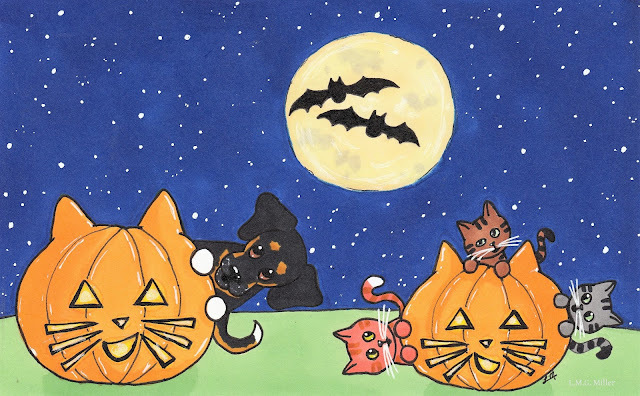 In case of an accidental escape on a busy night like Halloween, be sure that your furbaby is wearing a tag and/or has an up-to-date microchip. Of course, it is wise to ensure this all year round! Today the kitties are here to give a review as part of the Chewy.com Blogger Outreach Program. Some of you might remember how picky the kitties around here are, and how we're always on the lookout for new food the kitties might deem worthy. This time around, we decided to try that out with the Tiki Cat After Dark variety pack of moist cat food. I first opened a can of chicken goodness for my kitties. If I'm to be totally honest, I thought this looked sort of like some yummy chicken noodle soup myself. That's just me, though. Besides, it's the kitties' opinion that really matters. So, I called the kitties over to have them give it a try. Guess what? Not a single kitty in this house would eat the Tiki Cat moist food. Not really surprising, but still a bit disheartening. Fear not, though! 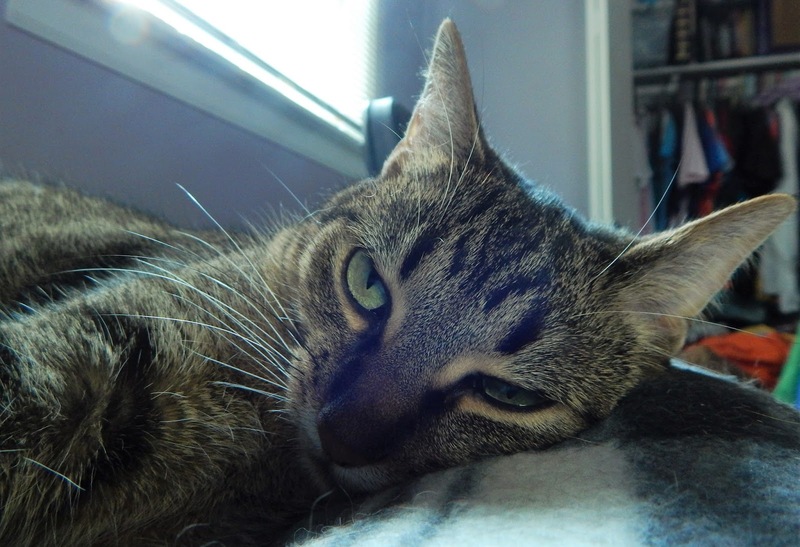 I took the Tiki Cat food to my parents' 11 cats, and they all love it. So, while my kitties gave the Tiki Cat After Dark variety pack of moist food zero paws up, my parents' cats gave it roughly 44 paws up. Go figure. We're wishing everybuddy a scrumptious Monday! 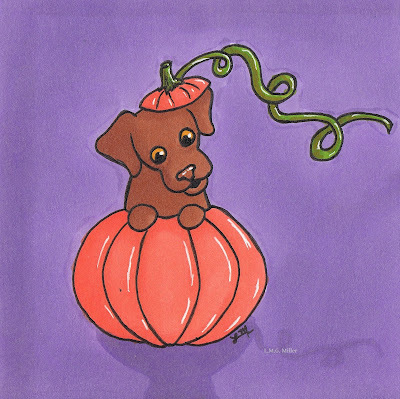 If you are handing out candy on Halloween, ensure your furbaby's safety around the open door. Keep your kitties and pups in a part of the house away from the door if needed, or in some sway block them from the door. For example, you can use a safe and secure baby gate or pet gate to block your furbaby's access to the door. As always, it is always better to be safe than sorry! Hi, everybuddy, it's Thimble here. I was all ready to snap some selfies for today, but it wasn't meant to be. My momma had something else in mind. Something pretty gruesome. It all started when my mom brought a pumpkin into the house. It was a giant pumpkin, and I sniffed it all over, and I even tried to climb it. It was pretty cool, I decided. But, then, this is where it gets gruesome. My momma, she grabbed a knife, and she started stabbing the pumpkin. She stabbed it all over. There were guts everywhere. And you know what happened then? My momma posed her victim for a selfie. How weird is that? And then my momma lit her victim on fire. I need to ask you friends something. Do your humans ever murder pumpkins with knives? Do they set them on fire? I hope I'm not the only one with a mom like this. Well, either way, happy Sunday! 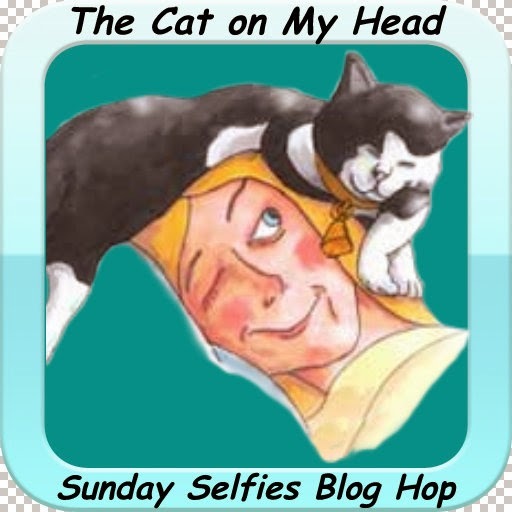 And don't forget to visit the Kitties Blue over at The Cat on My Head for the Sunday Selfies blog hop! You know what else happened this weekend? Snow flurries were flying through the air. The seasons are starting to get really confusing. Anyway, we made an ornament to wish everyone a, um, Merry Halloween? There is often extra traffic outside on Halloween. This can lead to a lot of extra people, noises, and other scenarios that could potentially frighten your kitty or pup. What's more, though much of the traffic on Halloween involves innocent children seeking candy, not all those out and about on Halloween are so innocent. Some people might, unfortunately, have malicious intent on Halloween. For example, sometimes black cats are targeted for cruel jokes on Halloween. For all of these reasons, please try to keep your furbabies indoors during Halloween festivities. Try to avoid walks and other outdoor activities, so as to keep your furbabies as safe as possible. Unsurprisingly, our doodle for Athena's Caturday Art blog hop is yet another one created for the Halloween season. 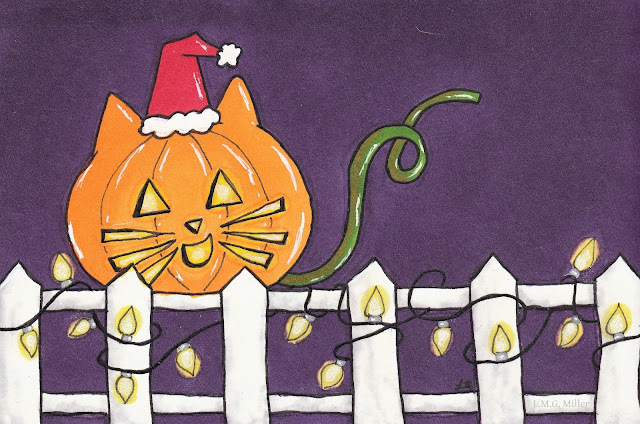 This here human is having way too much fun doodling cat-o'-lanterns. It is quite possible that they will make appearances even after Halloween is over. We hope you don't mind. Now, don't forget to visit Athena to see the art of all of our friends! Bats may be a common symbol of Halloween, but did you know that they are also one of the primary carriers of rabies? What's more, their teeth are so small that a bite is often difficult or impossible to detect. For this reason, if you have any concern of bats being in or around your home, such as in the attic or in nearby trees, take all precautions to keep your furbaby safe. Rabies vaccines, for example, can help protect against rabies. As you all know, rabies is not a disease to take lightly, so do your best to keep your furbaby safe from bats and other risks for the disease. You probably know what we're starting with today. The Friendly Fill-Ins challenge, of course! 1. I would like to interview _________. 2. I would like to be interviewed by _________. 4. Once Halloween is over, _________. 1. I would like to interview J.R.R. Tolkien. 2. I would like to be interviewed by my furbabies. 3. Halloween night is one of my favorite nights of the year. 4. Once Halloween is over, I'll start gearing up for Christmas. As always, now it's Eddy's turn to star in this post! What do you all think? Is this a scowl? A wink? Something else altogether? If your furbaby enjoys dressing up for Halloween, please make sure any costume they wear is safe. If there are loose pieces, such as strings or pom-poms, be sure to either remove them or closely monitor them to prevent injury. If you take your furbaby out for a walk in their costume, especially at night, ensure that it can allow them to be seen by both pedestrians and drivers, such as by means of reflective or bright pieces. Of course, it is also important to ensure that they are easily seen at night, such as with a reflective collar, any time of the year. Some furbabies are not keen on wearing costumes, so do keep this in mind as well. For those who do enjoy it, though, be sure help them stay safe while donning their special wardrobe! Thursdays are one of our favorite days to blog. Why? Because there's so much fun to be had. To begin, we have the Thoroughly Poetic Thursday challenge, hosted by Angel Sammy and Teddy. These can be gained whether in preschool or college. Who can nurture blooms of all kinds. Yet his worth is far more than that of a penny. Whether it be in history, spelling, or math. And can even teach you the continents of the globe. Students need teachers to expand their minds tenfold. Students need teachers like Teddy in order to grow. But without teachers like him we students would be lacking plenty. Do be sure to visit the real Teddy! 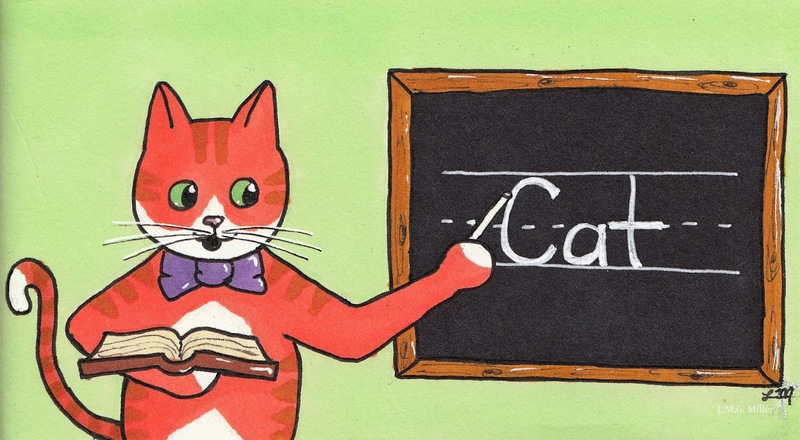 And of course we didn't forget to doodle a little something up for Teddy the Teacher. One last thing with regards to poetry. We're wondering if any of you can help us with a couple of the upcoming weeks of the Thoroughly Poetic Challenge? You see, perhaps this silly human's mind is just having a brain fart, but we need a little assistance with the upcoming letters U and X. As you've probably noticed by now, we quite like to use you blogging friends of ours as inspiration for our poems. But, we can't seem to conjure up any blogging buddies with names that begin with U or X. We hope we're not just being silly and forgetting any of you. If we are, though, please let us know! We have a couple of ideas in the case that no U or X can be found, but we sure would like to know what you all have to say first. 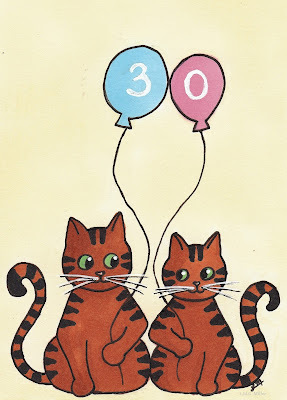 Thank you, friends! And now it is Thimble's turn to star in this Thursday post. One of Thimble's favorite things to do is help her momma doodle up some art. Actually, though, that's not what was really going on in that picture up there. This here human was trying to photograph those there doodles in order to share them with you here on our blog. When Thimble hears the camera, though, she simply has to be involved. After all, she is a model. Are any of our friends out there like Thimble? Do you love to hog the camera be a model? 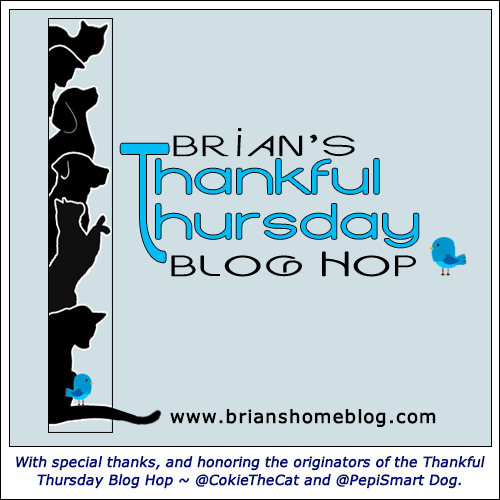 Today, Thimble is sharing her gratitude for the camera and for her supremely photogenic face for Brian's Thankful Thursday Blog Hop. All of us here are thankful for all of the blessings in our lives. 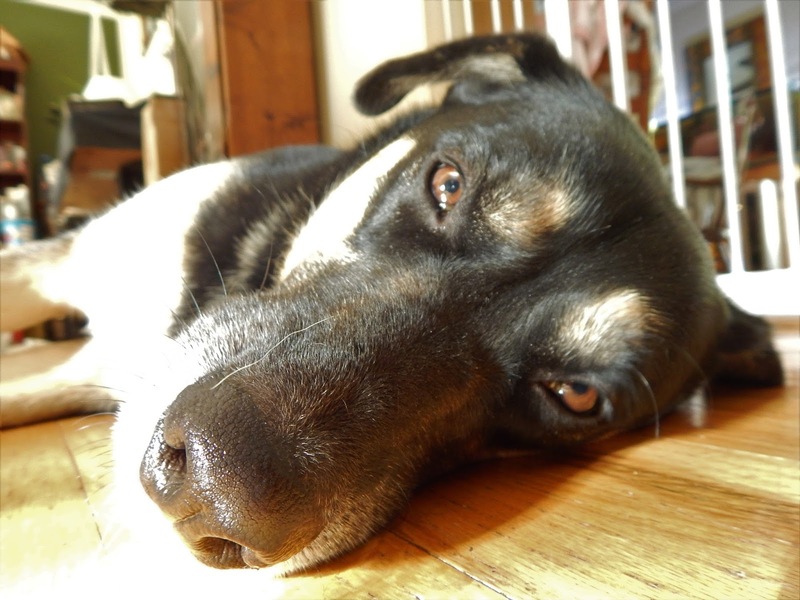 We are thankful that our pup Astrid was deemed cancer-free this week. We are thankful to have each other, to have the safety of a warm home, to have food in our bowls, and to have loving family and friends like all of you. Happy Thursday to all of you wonderful friends of ours! Are you interested in giving your furbaby a fun little "candy" or "chocolate" treat, such as for Halloween? One safe option is to look for treats made with carob. You can also obtain carob and make your own treats for your pup or even your kitty. This is because carob is an alternative to cocoa and chocolate that is safe for dogs and cats. It has a taste and appearance more or less comparable to chocolate, but does not contain theobromine, the component of cocoa and chocolate that is toxic to dogs and cats. That means carob can allow your furbaby, such as pups who have a sweet tooth, to have a special yet safe treat. One of Astrid's fully toed feet. Today is one of those days when we share a doodle that makes next to no sense. I scribbled up what I thought I'd call catty corn, but I'm not so sure about the result. With Halloween fast approaching, remember to keep that candy away from the furbabies. Chocolate, excess sugar, various artificial sweeteners, and other potential ingredients of candy can be toxic to our kitties and pups. Be especially careful with candies that might carry a double whammy, such as dark chocolate covered raisins. 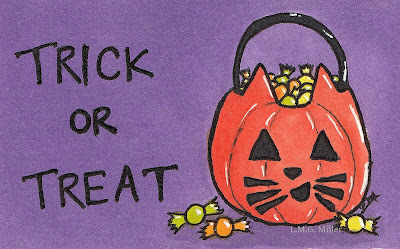 Then again, it's safest to simply assume all candy is dangerous to furbabies and to keep it all out of their reach. What a strange title for this post. But, it is what it is. Today's review for the Chewy.com Blogger Outreach Program comes from the three-toed pup around here. To be fair, it's only her back right foot that's three-toed, but more on that in just a bit. At this very moment, Astrid is here to review Newman's OwnⓇ Snack Sticks in chicken and rice. As is always the case for the picky pup around here, soft and chewy is essentially a must when it comes to treats. We don't want to have to chow down on anything in the crunchy category, peeps. That being said, the Newman's OwnⓇ Snack Sticks are indeed soft and chewy, giving them an automatic lead. These treats are made with organic chicken, grains, and vegetables. They also contain no artificial flavors, colors, preservatives, wheat, or corn. All of that sounds great, but did the pup like the treats? She sure did (not that you can tell that in this fantstically blurry photo)! In fact, after both of Astrid's surgeries earlier this month, there was a day or two when she didn't want to eat real food. All she wanted was peanut butter. But, she would also eat these Newman's OwnⓇ goodies, so that was a plus! Now, speaking of Astrid's surgeries, she is doing well these days. And you know what? The biopsy of her amputated toe came back with wonderful news! All of the margins of the sarcoma were successfully removed by the toe amputation. This led to the surgery being labeled as "curative" for Astrid's cancer. Needless to say, this makes us very happy! Astrid is still in her bandage, about which she is less than thrilled. She just went to the vet yesterday for yet another bandage change, at which time the veterinarian said that her incision looks great and is healing well. The vet wants her to continue wearing a bandage until this Friday, when she'll go to the vet again to have the bandage removed and the incision checked again. Then, on Halloween, she gets her sutures removed and this will all be a thing of the past. Woohoo! And do you know what else? We have such wonderful friends in all of you. You have sent us so much love and support while Astrid has been going through all of this. We cannot thank you all enough! Decorations are not just something to be careful of around Christmastime. 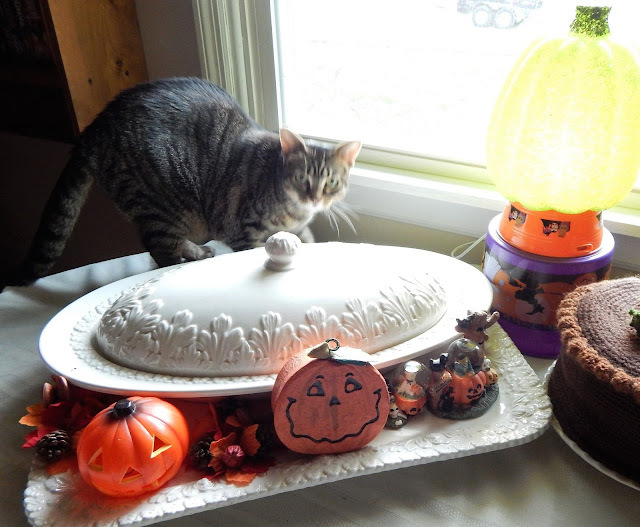 Some of us also decorate for autumn and Halloween, and it is important to place all decorations with our furbabies' safety in mind. Even for Halloween there might be garland or wreathes, and surely we here aren't the only ones who put out lots of little black cats and pumpkins and scarecrows throughout the house. Any such decorations can potentially include parts and pieces with choking hazards, which can also lead to obstruction or perforation of the gastrointestinal tract. Some decorations could even potentially contain toxic parts and pieces, even if unknowingly. So, always be sure to inspect and monitor all decorations, and to place them with caution, all year round! It's Mancat Monday, which of course means Evan is here today. What's more, on this particular Mancat Monday, Evan has a wish. Evan's wish is that his Gammy and Pawpaw have a wonderful anniversary today! This here human's parents have been happily married for three decades now. 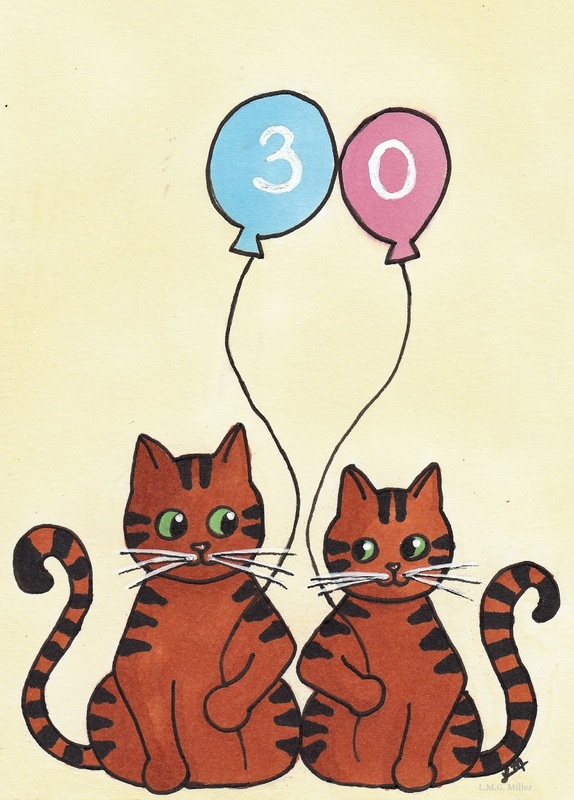 All of us here wish them many more! Have a magnificent Monday, everybuddy! Strays, ferals, and other outdoor critters will often try to find warm places to sleep at night. Sometimes, this might be up in your car, such as near its engine, which they might have found warm after you drove it last. For this reason, always be careful when staring your car and driving off in cold weather. Check under your car if you can, and honk your horn and/or make other noise to scare off any critters who might be hiding away up in your car. Guess what? Eddy decided to snap a selfie today! Even she got so excited that she tried another. But, in true Eddy style, it ended up a tad bit blurry. To see if there are any other surprise selfies today, and to see all the stupendous selfies of our friends, be sure to visit the Kitties Blue of The Cat on My Head for the Sunday Selfies blog hop! 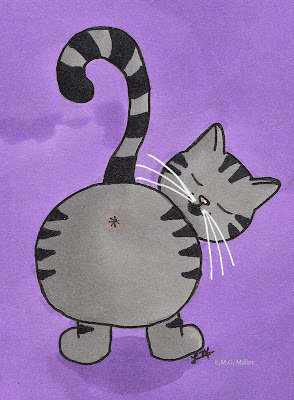 Just yet another little magnet we doodled up. If you feed outdoor strays and ferals, or even if your furbaby spends time outdoors, remember that water of course freezes, so keep this in mind when leaving out water or even moist food in cold weather. Try to refresh these as often as possible, remove ice from the water, or in some way ensure that they have fresh, unfrozen water and food. If possible, try to provide a place that could perhaps allow both the outdoor furbaby and their resources to remain warmer, such as by means of a safe outdoor heating pad and a shelter. 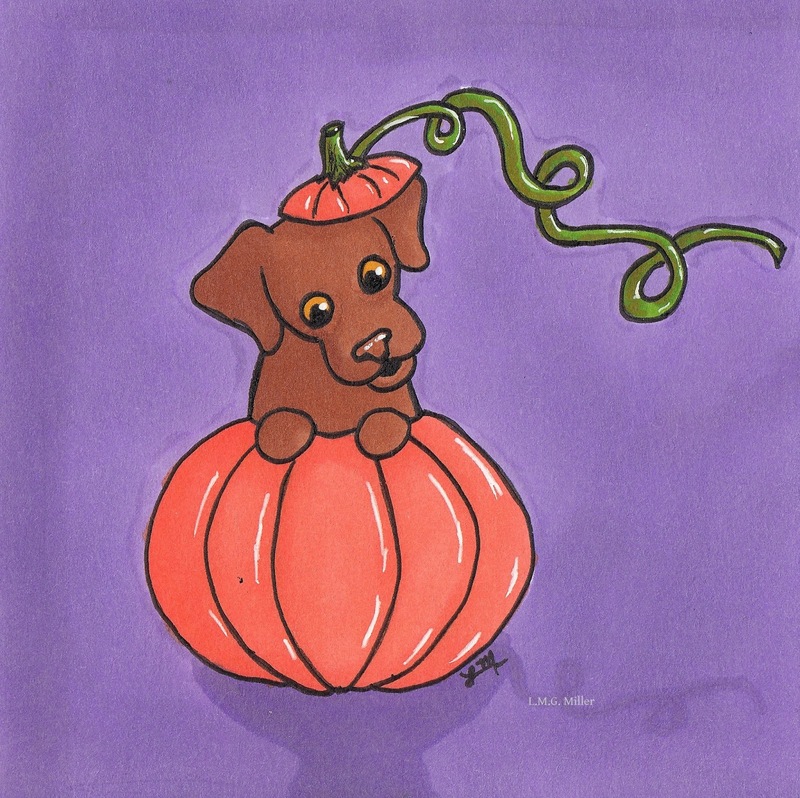 Today we have a bit of a doodle to share with you. 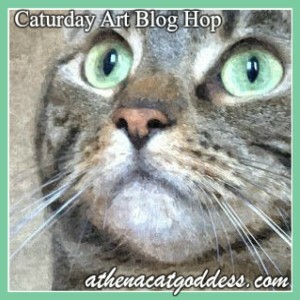 After all, it is the day of Athena's always fun Caturday Art blog hop. 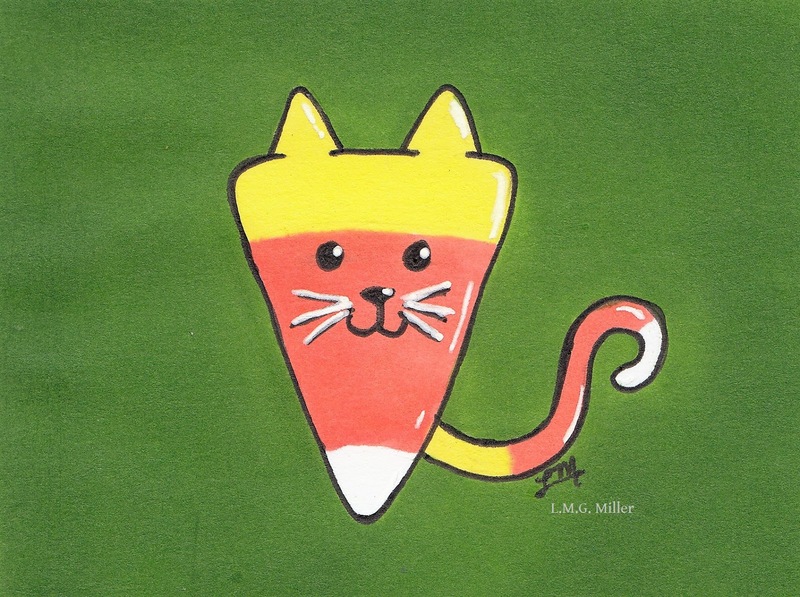 Today's particular doodle stars, yet again, a cat-o'-lantern. This time around, though, said cat-o'-lantern seems to be a bit confused. Or, perhaps this here human is just confused? What do you think? Is mixing Halloween with Christmas just downright naughty? Or is a holiday mashup permitted this time of year? Oh, and one last thing. When we asked you all if you liked our haunted house header or our cat-o'-lantern header better for Halloween, we ended up with a bit of a split in the polls. So, we're just going to give each of them a turn! 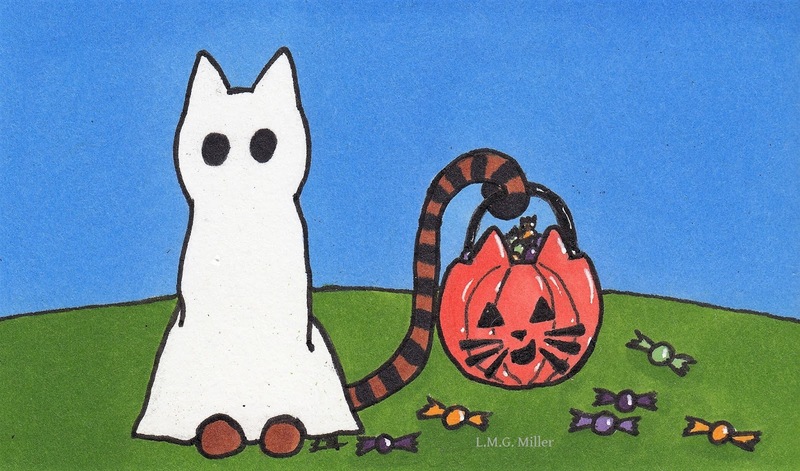 In case you hadn't noticed, we are now on the cat-o'-lantern doodle of a header. As you all certainly know, water intake is crucial for our furbabies. That being said, consider that when the weather outside gets cold and the furnace inside begins running, things can get a bit dry indoors. Your kitty or pup's water bowls might run low more often due to increased evaporation if the air indoors is dry from the furnace. Or, the water bowl might need filled more often if your furbaby is getting more drinks to combat the dryness. Either way, do be sure to check and refresh the water bowls often, especially in a dryer atmosphere. To help keep things comfortable and moist, you can also consider using a humidifier in the home. This can help combat dryness overall when the furnace is running, including helping with dry skin and coat. Water intake is important to consider not only in the hot summer months, but also in the cold winter months! We usually start our Fridays with the Friendly Fill-Ins challenge, but this time around we'll mix it up a bit and start with a little something else. Today is the most important day of Tocktober. Let's be honest, the furbabies around here have been withholding. Not a single one of them has allowed a single shot of their tocks to be snapped as of late. Fear not, though, for we have some flashback tock shots. 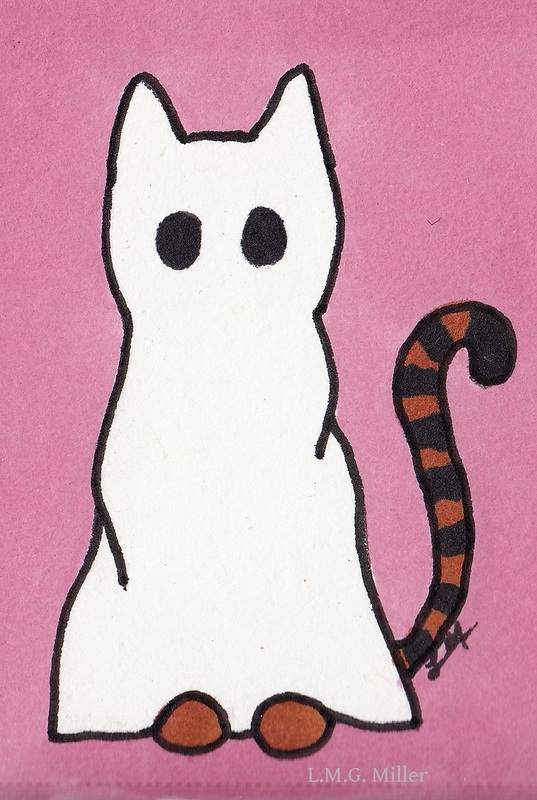 For today's Tocktober festivities, we're doing a flashback to last Halloween. These oldie but goodie shots involve a little ghost, an orange mancat named Evan, and a little cameo from said mancat's tocks. We have Evan's auntie (this human's sister) to thank for these shots. 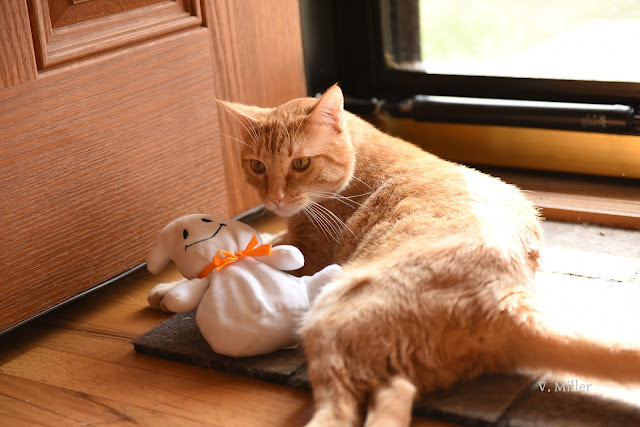 When Evan kidnapped himself a ghost from his mom's collection of Halloween decorations last year, his auntie whipped out her camera and snapped these evidence photos. Evan is a little perturbed that I didn't block out his private bits, but so it goes. I most certainly can't take credit for this design. Thanks to Pinterest, I recently saw a photo of some coasters designed like this. If that's not inspiration, I don't know what is. And now we will move on to the fantastic Friendly Fill-Ins challenge. 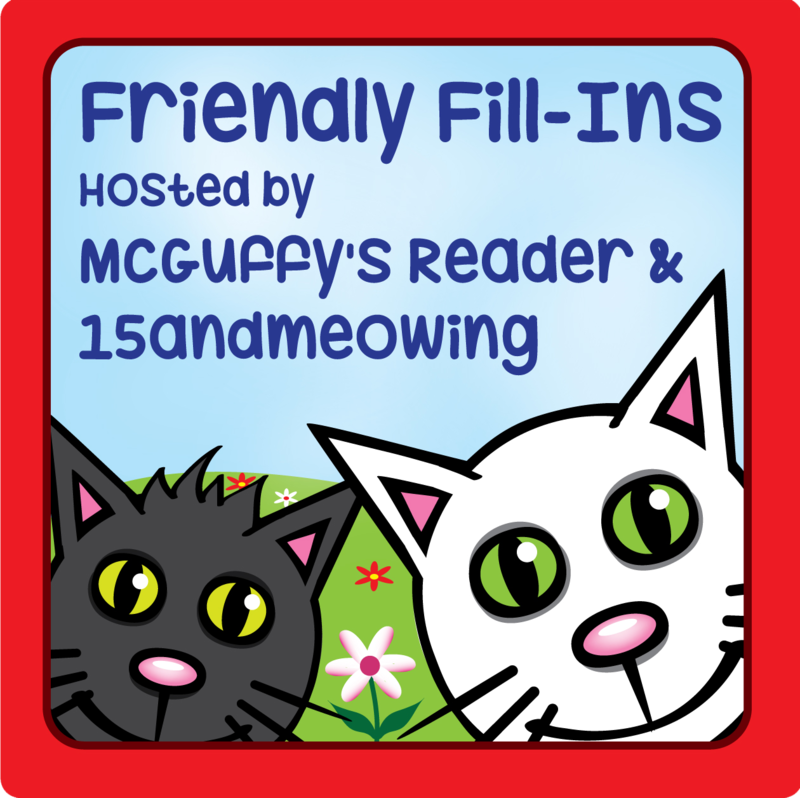 Our hosts over at 15andmeowing and McGuffy's Reader thought up some fun and festive fill-ins this week, that's for sure! 1. If I was a ghost, I would haunt _________. 2. I always _________ when _________. 3. My favorite scary story is _________. 4. I will be so glad when _________. As always, I did my best to do these proud. 1. If I was a ghost, I would haunt an animal shelter. 2. I always have to prepare the couch for Evan when I settle down for evening TV. 3. My favorite scary story is The Hound by H.P. Lovecraft. 4. I will be so glad when Astrid's bandage is removed and her incision is healed up. Now, this post isn't over yet. We of course can't forget to give you your Eddy fix! We want to wish you a happy Friday! As cold weather settles in, don't forget to have your furnace checked and cleaned as needed before you run it for the first time this autumn or winter. Also, don't forget to change the filter regularly. Neglecting the furnace and its filter can of course put you at risk of hazards such as a fire, but can also exacerbate things such as allergies and asthma, for both ourselves and our furbabies. So, for both the sake and safety of your furbaby and yourself, take care of that furnace! We have yet again reached the eve of Friday. Hooray! As always, we're going to start today with the Thoroughly Poetic Thursday challenge, hosted by Angel Sammy and Teddy. Today, we've reached the letter S. Can anyone guess who we have for you to meet today? They’re really quite the same. Their difference is only in the name. Sammy is giddy over it, though. It’s science like this that he loves to know. At least when it comes to molecular weight and electron flow. On Sammy’s knowledge you can be reliant. Do you wish to know about alkanes, alkenes, or alkynes? All of these terms Sammy the Scientist can help you define. And can even draw you a diagram if that’s what you’d like to see. Sammy’s knowledge on science is ever so boundless. He even knows that outer space is not all that soundless. 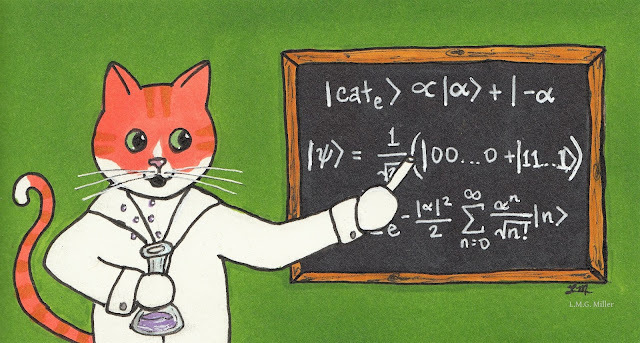 In Sammy the Scientist you can confide. He will happily be your science guide. Now it's Thimble's turn to show you what all she's been up to. After all, Thursday is for Thimbles. Unsurprisingly, Thimble has been spending plenty of time in her library, guarding her beloved books. 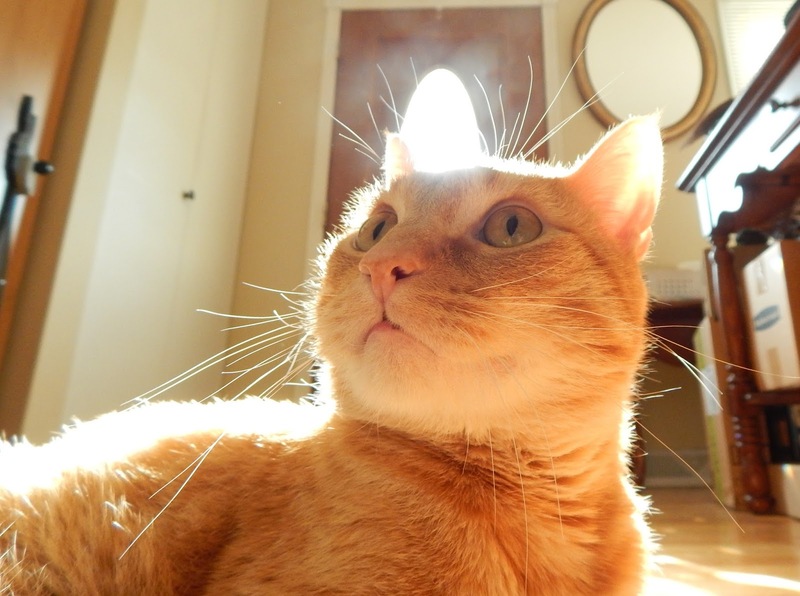 Her favorite is when she's lucky enough to enjoy some sunshine in that library of hers. Of course, Thimble wants to enter her beloved library and sunshine in Brian's Thankful Thursday Blog Hop. We have so much for which to be thankful. All of us here are so grateful that our pup Astrid's toe amputation following her sarcoma diagnosis was successful. We are so happy to have her home and recovering. Final biopsy of the toe is still pending, but we are nonetheless thankful for the progress so far. In addition, we are also of course grateful for you wonderful friends of ours! Did you know that studies have revealed honey to have healing properties? Our vet recently mentioned that, should Astrid's incision need assistance in healing faster, they could apply a honey bandage. That being said, there is medical-grade honey available, as regular honey purchased at a grocery store may not be sterile enough to have proper healing effects. Not just can honey be used for wounds, though, but it also offers a great source of sugar for hypoglycemic patients. If a kitty or pup is diabetic and in a hypoglycemic emergency, rubbing honey on their gumline or in their cheeks can often help to correct the hypoglycemia. Honey can be a very beneficial substance, but of course do consult your veterinarian with any questions regarding your furbaby's health and how to use honey if it is needed. This little lady had the outermost toe of her right hind leg amputated yesterday. It is believed that the sarcoma on the paw pad should now be gone in its entirety. Nevertheless, to be safe, the toe is being sent out for biopsy, to ensure that all margins of the tumor were removed. In addition, we of course will always keep an eye on that area, as well as the rest of Astrid's body, for any potential recurrence. For now, though, we are being optimistic. Prior to surgery, Astrid had a chest x-ray done. The veterinarian did not expect to see anything concerning, but did want to be safe and ensure there was no metastasis visible in the lungs or elsewhere. 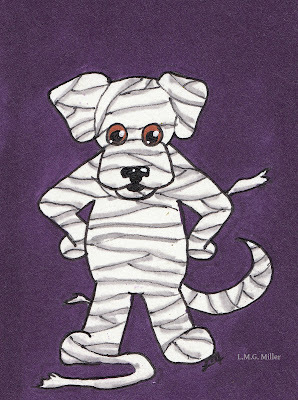 Nothing abnormal showed up on the x-rays, thank goodness! Astrid's bloodwork was also all good. Since the surgery, Astrid has been doing pretty well. She came home still pretty drowsy from the anesthesia, which is a feeling that she clearly does not like. Also, just like the last time around, she is not a fan of the bandage applied by the veterinarian. Understandably, the vet wrapped the bandage tightly enough that Astrid cannot get to her incision and sutures. But, let's be honest, Astrid is not a fan of tight bandages. After her initial mass removal last week, Astrid only stopped moping and perked up when we changed the bandage at home and wrapped it more loosely. This time, though, the bandage has to stay on for a couple of days, and she'll be going back in on Friday to have it removed, the incision checked, and a new bandage applied. When necessary, Astrid has to wear the cone of shame to keep her from the bandage. She is also still getting pain meds and anti-anxiety meds as she heals, to keep her as happy and calm as possible. The Battle of the Bandage will probably rage on for the next couple of weeks while the incision heals. Hopefully this little mummy pup can handle it. Thank you all again for the purrs, barks, thoughts, prayers, love, and support you've been sending our way! Astrid and all of us here appreciate it more than we can ever express. Though you'd think it would be a simple task, keep in mind that sometimes there is a right and a wrong way to clean and bandage a wound. Depending on the location, depth, and overall type of wound, certain materials and techniques might work better than others. If cleaning a wound is necessary, safe options might include warm water, an antiseptic solution such as chlorhexidine, or another solution offered by a veterinarian. Once cleaned, a typical bandage often involves using a non-adherent pad, which can then be wrapped with gauze, which is then often held in place with self-adherent bandaging and/or medical tape. Then again, sometimes bandaging is not required, or is only required for a short amount time, after which exposure to air might be needed in order to allow the wound to heal better and faster. Then there is the topic of whether or not to use an ointment on a wound. Some antibiotic ointments used for humans are not the best choice for animals, and sometimes moisture from an ointment might not benefit a particular wound. In some cases, medicated powders allow for the best wound healing. For all of these reasons, when in doubt, whether it be an accidental wound or an incision from a procedure, it is often best to consult your veterinarian about cleaning and bandaging. Having a professional clean a wound and apply bandaging for you is never a bad idea. 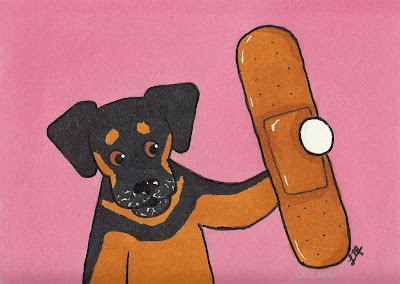 If at-home bandaging is required or beneficial, though, then never hesitate to ask your veterinarian to demonstrate or explain the process to you. Today is the day pup Astrid goes in for her toe amputation, so as to remove the sarcoma on her paw pad. She had the tumor itself removed last week, as many of you already know, but the biopsy that revealed it to be a soft tissue sarcoma also revealed that not all of the margins were removed. Hence the toe amputation today. That there bandage is actually one that I put on Astrid's paw at home. The vet put on the first bandage after the surgery, and it was all pretty and blue. When I raided the first aid aisle at Walgreens to prepare for the at-home bandage changes, though, I found that their bandage selection was not as colorful. Astrid's paw looks like that of a mummy. I guess we know what she'll be dressing up as for Halloween this year. We again want to thank you all for the love you've been sending Astrid's way! It truly means so much to us. Needless to say, we cannot wait to have Astrid back home with us tonight and on the road to recovery. The second round of Astrid vs. Bandage will be airing soon. 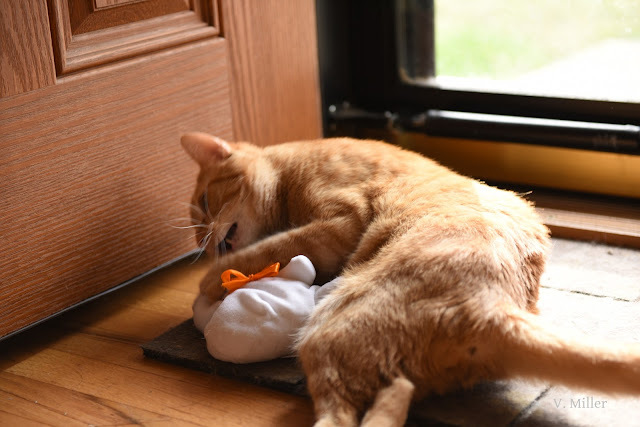 Yesterday we talked about the importance of understanding and following at-home care instructions after a furbaby has undergone a procedure. Just as important, though, is making sure to follow all instructions prior to a procedure. One of the simple rules is that you should not feed your kitty or pup after 10 pm or so on the night prior to undergoing anesthesia. This is because a cat or dog should have an empty stomach when being anesthetized, in order to prevent issues such as aspiration. They can, however, still drink water. In addition to this, you should talk to your veterinarian about what medications should and should not be given prior to a procedure. In some cases, depending on the situation, your furbaby might need something such as an anti-inflammatory prior to surgery. This might be the case if a growth is being removed and inflammation needs to be at a minimum prior to surgery. In other cases, you might need to hold off on giving other medications, such as if your furbaby is on a pain medication that might be excessive with medications being given on the day of the procedure. For these reasons and more, always discuss with your veterinarian what is expected prior to surgery, so that everything can run as safely and smoothly as possibly during the procedure.